Shotgun Heavy, AKA “Fat Scout”, is a method of playing Heavy by attacking and killing enemies with only your secondary and melee weapons. Not a supremely easy (or even very effective) strategy, it is more for use in the mindset of not entirely caring or messing around. As such, if you are in a situation that you playing Shotgun Heavy is a pure detriment to your team and is causing your team to lose, don’t do it; more, reserve Shotgun Heavy for times when you’re on a team that is good enough to where you can essentially do whatever you want, or you are on a server specifically for messing around, such as any dm server, hightower, pubs, etc. The Shotgun – At 60 base damage and 6 shots, you’ll be pushing out fair damage if you are landing your shots, and is also very strong at point-blank range. Nothing really special about this weapon; 50% ramp-up and 50% falloff. Family Business – 53 base damage and 8 shots leaves it with higher damage per clip, but you will have to spend more time to deal this extra damage. This weapon’s extra two shells gives it a room for error margin that compliments the Shotgun Heavy playstyle well, as well as being very good with the Killing Gloves of Boxing. The lower damage still rounds up at far range; if you’re dealing chip damage from far away, you can still do 3 damage a pellet as you could the stock Shotgun. Both of these weapons can 2-shot 125 HP classes at point-blank range. The Killing Gloves of Boxing – For this guide, this is the only melee weapon I will be referring to, as it is arguably the best weapon for the Shotgun Heavy playstyle. If you whittle down an enemy to low health, manage to corner them and kill them with this, you will be rewarded with 5 seconds of crit Shotgun or Family Business, benefiting the Family Business more as it can rifle off more shots in the limited time. All other melee weapons can be used as needed, such as the Gloves of Running Urgently to get to the front lines faster on larger maps, or the Fists of Steel to protect yourself in dire times. Both of these weapons suffer from damage vulnerabilities, however, and are thus discouraged for actually attacking people with. Pick your fights. Don’t waltz up to a Minigun Heavy and expect to win unless you just knocked out their Sniper with your KGB. The “Fat Scout” is meant to be played as its namesake class, albeit fatter and slower. Ambush. Getting in the damage first turns the tides in your favor greater. Use this for all occasions; drop down on enemy Engineers or Soldiers, get in some shots before they do and kill them. Feign injury and catch them off-guard. Your health is a tool. Let’s say you are combating a Soldier and you get hit with a rocket and you lose 90-100 HP. If you tell you’ve dealt ~80 damage and they have no means to heal themselves or disengage, you can round a corner and wait for them to chase you; jump them with the KGB, kill them and use the crits for their teammates, if there are any nearby. As said, your health is a tool. You have free reign to let yourself take damage and keep fighting. 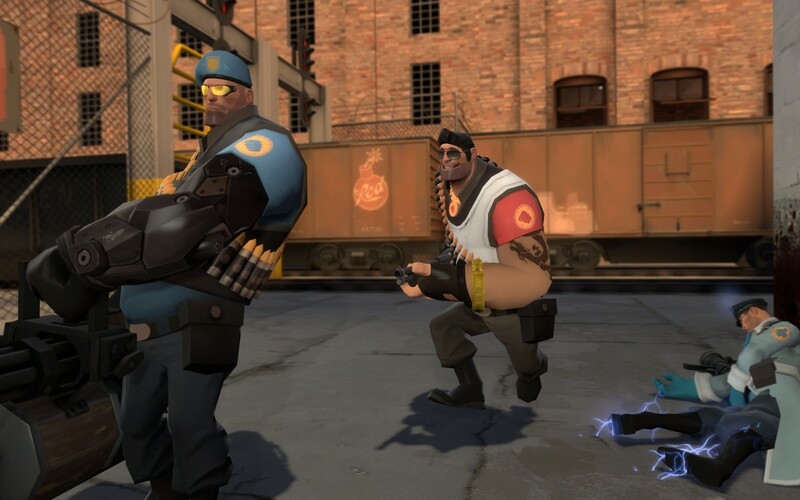 That’s what the Heavy’s health is for. A Caberman flies at you while you have full health? Heck, let him hit you and proceed to pop him out of the air, then go and heal up. Travel with your team. Because you won’t be using your Minigun, the Heavy’s core weakness, his slowness, will make you quite easy to kill in weighted situations. With some help, though, you’ll be more at ease with your health and steady damage. You are such an uncommon sight that people will often not know what to do with you. I’ll admit it: Shotgun Heavy is generally ineffective unless your opponents are not very good or you are in a mess-around environment. That is why a Shotgun/FB-only Heavy is a fairly rare sight. Most people fighting Heavies are used to easily-hittable, spun-up ones, not Shotgun-toting Heavies rumbling towards them. Many Demomen, Medics and Engineers panic and just try to run away as if you were going to use your Minigun. Try playing Fat Scout sometime if you’re in the mood to screw around! In my opinion, it’s among the most fun non-serious ways to play Team Fortress 2. My Epic Family Business and Face-melting Killing Gloves of Boxing agree. Curse of Sudden Death! Arena!